Oh wow, Kim...they look gorgeous!!!!!!!!! Kim, I know exactly how you felt. 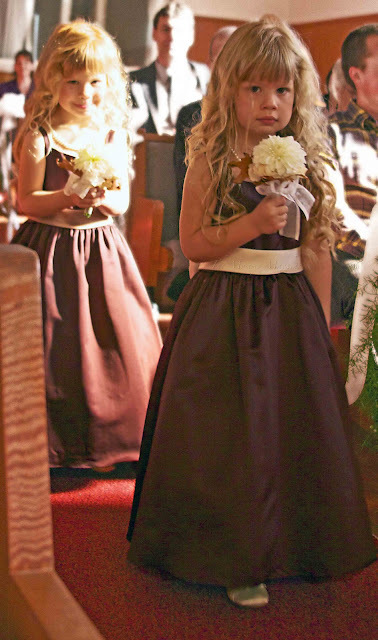 A few years ago my two daughters were flower girls in my sister's wedding. I couldn't stop the water-works! Your girls are absolutely beautiful! Tears of joy at least let us know that our hearts are full and that we love deeply! Oh, my - they look like angels! I'm about to cry and they're not even mine - no wonder you were sobbing! They look absolutely darling! I think I would cry if my kids did that. But thankfully, they're boys, and just wild enough they will never be invited to be in anyone's wedding. Maybe not even their own. hahaha.. you got me there. oh my, i should stop by your blog for more. I could love those two! Wish I could meet them in person. Heavens to Betsy! They look so grown up! The hair, the dresses ..... Your girls are beautiful!! Really makes you fast forward, and see them in their own weddings.